inqaba biotec™, Seegene Diagnostics & the Bernhard Notch Institute for Tropical Medicine facilitated training in respiratory and gastrointestinal diagnostics as part of a training initiative part of the East African Community Regional Network of Public Health Reference Laboratories for Communicable Diseases, an initiative established and funded by the Federal Government of Germany through the German Development Bank (KfW). 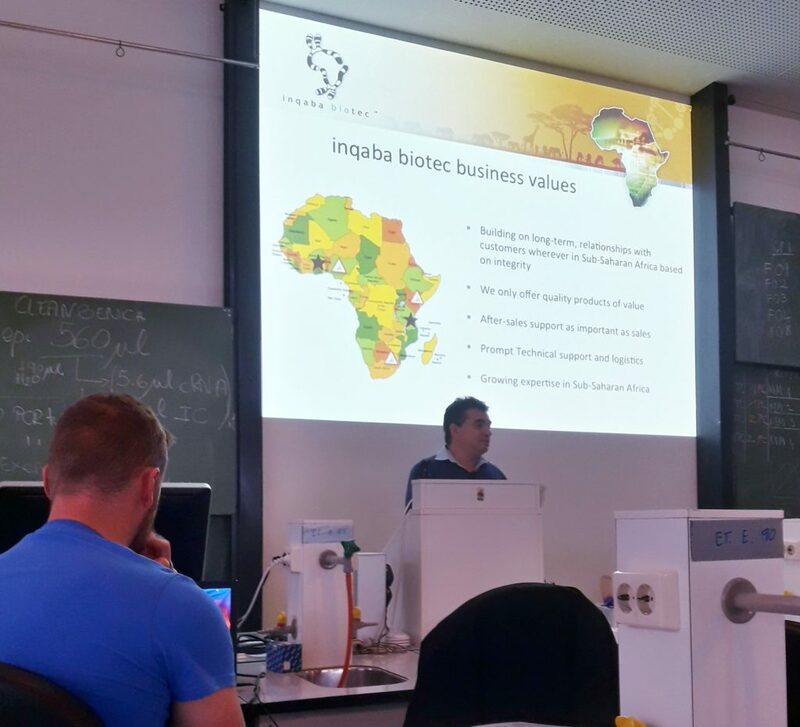 Dr Oliver Preisig, executive director of inqaba biotec™ presenting on our business values and vision for Life Sciences in Africa to the delegates that attended the training on Diagnostics of Communicable Diseases. Dr Oliver Preisig, executive director of inqaba biotec™ presented on our vision to facilitate life science research and provide molecular diagnostics in sub-Saharan Africa by offering the best value products, services, support and logistics; while building relationships with our customers to grow expertise in sub-Saharan Africa. 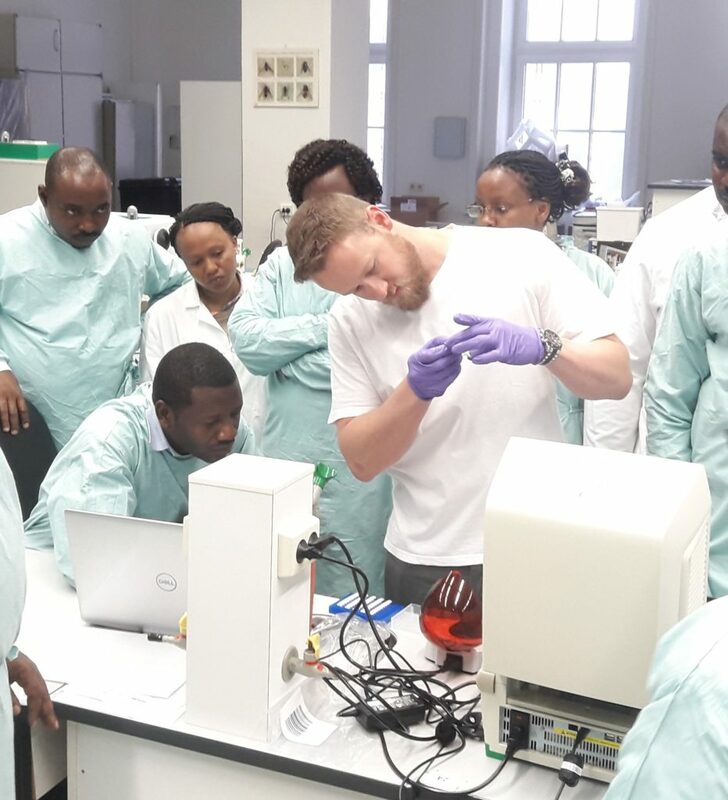 Donald van der Westhuizen, Molecular Diagnostics Business Manager of inqaba biotec™ presented the training on various Seegene Diagnostic kits for the respiratory and gastro-intestinal product portfolios. Seegene Diagnostics manufacture a myriad of CE-IVD marked diagnostic products; Allplex™ and Anyplex™ are real-time PCR based diagnostics platforms while the Seeplex™ is based on an automated capillary electrophoresis platform. Donald van der Westhuizen, Molecular Diagnostics Business Manager of inqaba biotec™ demonstrating the use of various Seegene Diagnostic kits for respiratory and gastro-intestinal diagnostics. Kenneth Mbwanji, Product Manager: Tanzania, assisted with facilitating support to the delegates. Allplex™ Respiratory Panel Assays provides a comprehensive assay for the detection and identification of 26 pathogens using One-step real-time RT-PCR. Allplex™ Respiratory Panel 1 is an essential screening assay for Influenza strains – Flu A, Flu B, RSV A, RSV B, with additional Flu A sub-typing. Anyplex™ II RV16 Detection is a more comprehensive product which detects 16 respiratory viruses providing a multiplex diagnostic solution to assist in the prognosis of viral infections. Seegene Diagnostics gastro-intestinal portfolio includes the Allplex™ Gastrointestinal Panel Assay (which provides a comprehensive assay for the detection and identification of 25 gastrointestinal pathogens 6 viruses, 13 bacteria and 6 parasites; using One-step real-time RT-PCR), and the Seeplex® Diarrhea ACE Detection Assay (which makes use of ACE platforms for the detection of 4 diarrhea-causing viruses and 10 diarrhea-causing bacteria. Delegates taking great interest in the demonstration by Donald van der Westhuizen, Molecular Diagnostics Business Manager of inqaba biotec™. We would like to thank all our delegates from East Africa for attending this training session, it was a pleasure providing the training necessary to expand your skills and to provide you with the tools to facilitate diagnostic testing services. We would like to extend a special thank you to the Bernhard Notch Institute for Tropical Medicine (BNITM) in Hamburg for inviting us to make use of your state of the art facilities and for providing us the opportunity to participate as facilitators for the training on Diagnostics of Communicable Diseases.